Okay, have I got something tasty for you. And yes, I may be harping on (and on, and on) about Around My French Table , by Dorie Greenspan, but what can I say? It's what I'm into at the moment, and it's a really big cookbook. With a ton of tempting recipes. That I absolutely must try. And sometimes share. Forgive me. So, today's treat? Smoked Salmon Waffles. 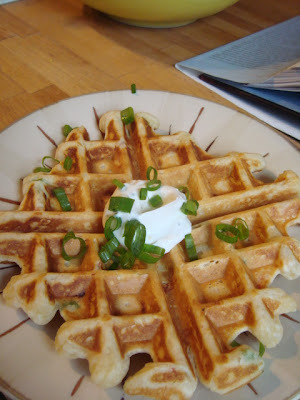 I may be alone here, but these were, as far as my sieve-like memory is aware, my first savory waffles. And I am a devoted waffle lover. (Have you tried Molly's waffle recipes on Orangette, by the way? Go there. Make them. Eat them. And love them.) Anyway, I've had savory crepes aplenty, scads of savory pancakes, but nary a savory waffle. How odd. I freaking love savory things. Right. Conjure up a vision of light, yet richly flavored waffles, with tiny, barely noticeable slivers of smoked salmon frolicking throughout. Just a hint of salty smokiness in the background, nothing aggressive that hits you over the head. Which we do try to avoid first thing in the morning. I don't know where you were last night, after all. Garnish that richness with a little lemon and chive scented sour cream. Perfect for a late breakfast or brunch. Or lunch. Or a grab-one-whenever-you're-hungry sort of snack, which is exactly how my kids rolled, with the leftovers. *Note: I didn't have whole milk, so I substituted with 1 cup 2% and 3/4 cup half and half. Worked great. Just saying, get creative if you have to. Follow the directions for your waffle iron, using about 1/2 (or so) a cup of batter per waffle. My batter was very thick, but who knows, yours could turn out differently, and that's just fine. 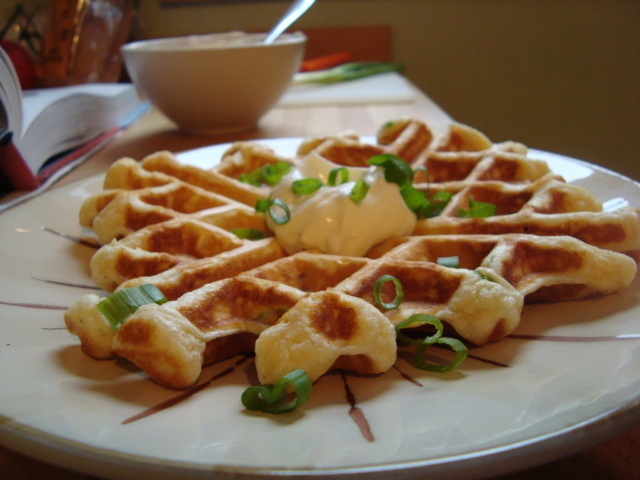 Garnish each waffle with a dollop of creme fraiche, or lemon scented sour cream, recipe follows. Dorie recommends also adding a little salmon roe, but as my normally huge supply of fish eggs was, for the moment, depleted (ha), we omitted that one. Mix it all together, that's it! Do you have an outstanding waffle recipe to share? Leave me a comment, if you do!